There’s been a lot posted on DigitSmith over the past year or so about new technology and design elements of various machines. Recently we’ve seen a post by a respected member warning potential purchasers of M&R equipment of a potential design flaw in the way that M&R mounts the drive system on their AC print-heads. Essentially the “Expert” is posting his opinions that the method used by M&R to mount their right angle worm reduction gearbox’s (WRG’s) with the electric motor facing vertically down, is a design flaw. Our expert goes way beyond criticizing the approach that M&R uses, by promoting the methodology used by a competitive manufacturer that totally avoids the use of a WGR, in favor of using a simple system of a toothed drive belt to achieve a geared reduction between the drive motor and the intermediate pulley to drive the print-head. Is the method that M&R is using to mount these WGR’s with the electric motor mounted vertically down, a manufacturer approved method? What is the “Mean Time Between Failure” (MTBF), and primary cause of failure that M&R has experienced from mounting WGR’s this way? Why does M&R utilize a more expensive WGR in their design when a simpler system of a toothed belt and pulley reduction is available? What additional level of friction and inefficiency is created by using a toothed drive belt versus the minimal drag of a lubricated WGR? What MTBF, or other issues with their drive mechanism has this alternative manufacturer experienced? Not really. Take the sportsman for example. On the ac print heads M&R uses a 90 degree gear reduction. The problem is they mount it with the motor down. This is not the best way for several reasons but the main thing is the oil is not sitting in the sump correctly and the oil seal between the gear reduction and motor is constantly submersed under the oil. So what happens when the oil seal starts to fail? Well the first thing is oil starts running down all over the motor. Not good. Now comes the serviceability of this type setup. You have to unbolt the heavy assembly, disconnect all the drive stuff to the squeegee/floodbar carriage and remove the gear drive and motor from the print arm. Now you have to remove the motor, drain the oil from the gear reduction, open it up, remove the gears and bearing, knock out the oil seal, replace it, put the whole thing back together and remount it. A lot of work for something that should never have been mounted that way in the first place. With the Printex there is no oil to leak, no heavy gear reduction. If ever needed changing the reduction pulley belt is quick and simple. 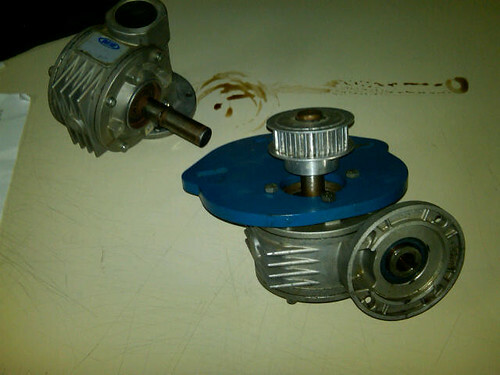 The ac motor is also very easy to replace if needed. Thanks for such an informative post Preston ... it explains why we see a lot of these GearBox issues in the field ... Do you know if M&R has addressed this known problem with their A/C Printheads :-? No spin as I did not say it had to be done every week. But when it needs to be done it is a lot of work and takes a long time. This cost you not only in down time but if you are paying a tech it cost you more if it takes him longer. Also on the sportsman the only way to adjust the belt tension is by loosening the angle drive gear box mount plate and then using a pry bar to slide it back on the slotted bolt holes. Again, time and money. 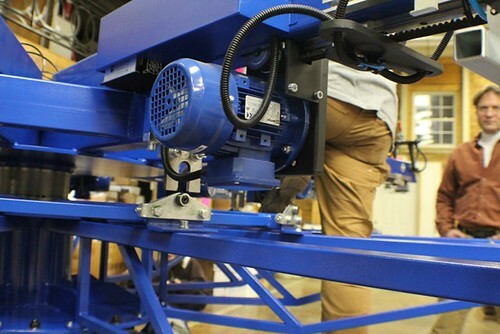 On the Printex you just lift up the front screen clamp and adjust the belt with a 10 mm wrench. Simple, fast and cost effective. This is the point of this thread. To show how the design of the printex saves you tons of time when and if you need to repair something. Most things are so simple you do not even need to get a tech in to do it. Becasue it is such a well thought out design things can be repaired or adjusted fast if needed. This means less downtime and that means you are making more money because your press is not down for a long time during repairs or adjustments. The sportsman is a great press but when it breaks down it is going to cost you a lot. Awesome post Peter it is sad tho that said expert instead of refuting any of your distinctions had to resort to his usual attack. What's there to refute ... you are big on common sense right? Robert: I'm back because the DigitSmith Site Administrators have implemented a level of moderation that curtails the personal attacks, and spread of blatantly false information. Your guy posted a lot of information on the design that M&R used for their AC print-head drives, and even went as far as to suggest that the system that another manufacturer is using is more effective. I refute the points that were made in the original post and have responded with a series of specific questions related to the design that M&R and PrintEx are using on their AC drive print-heads. I’d greatly appreciate getting “Qualified” answers to these specific questions rather than you just reposting the original unsubstantiated statements. 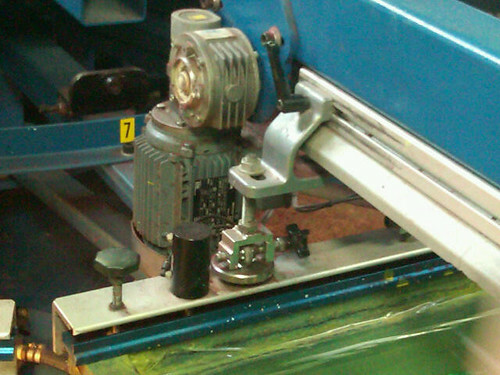 Do you realize that M&R’s original AC print-head drives from 10+ years ago used a very similar drive belt and reduction pulley system to what PrintEx uses today? Do you think there’s a possibility that M&R learned something about this design approach that drove their decision to move to a more expensive AC drive system that utilizes a worm gear reducer? So which is it, Printex, Marcodie, or the China machine. Crazy how you think they all are the best. Please pick a product and stick with it. It's just hard to keep up with your product choice. SCREENMACHINES, Great call, pick a brand. I think last week the mention was SRoque as well. Logic dictates any buyer will look at supply chain and downstream parts and profitiblilty of a company so it will still be there to service, and locally techs can support, and a second hand demand which only comes with a critical mass and a profitable, reputable manufacturer. You can't do that with twenty factories that all have a dozen presses in the market, you would grow and sell easier one manufacturer and get 240 presses in the market, then you would get better manufacturer support, marketing, and it would snowball with the critical mass. The shotgun approach of being all things to all people is not good business sense, next week will RWB be pitching us offset flex machines in case we want to go into printing plastic bags? NAZDAR, great questions, this is the comparison we need more of, and across more brands. RWB, Great answers. Explained and understandable. It's not about the person, it's all about the machine. Robert: This civil response is a positive development that I thank you for, and it would have been even better if the information that you had provided was accurate and correct. For example the fact that you can push or pull a PrintEx print-head by hand has everything to do with the different gear ratios being used than it does with “belt and pulley” versus worm gear reducer. So why would M&R use a much lower ratio than PrintEx? Could it be that it allows the AC motor to spin at higher RPM’s allowing the motor to develop higher torque, and for the cooling fan on the motor to work more effectively? His is an issue where it would be great to have Preston’s input on. And what are you smoking with your assertion that it’s less expensive for M&R to purchase a worm gear reducer than it would be for them to utilize a cheaper system of a belt and pulley? Are you suggesting that M&R couldn’t purchase a mass produced belt and pulley system than the current worm gear reducer? it actually has everything to do with the mechanics of worm gear itself <--- really suprised you didn't know that (have you never rebuilt one of these -or- do you just sell'em a replacement GearBox :-? it actually has everything to do with the mechanics of worm gear itself <--- really surprised you didn't know that (have you never rebuilt one of these -or- do you just sell'em a replacement GearBox :-? PW Response: Actually I’ve built and rebuilt many hundreds, maybe even more than a thousand Worm Gear Reducers to include the small format units used on the M&R press though to large format gear reducers used on industrial drive systems. Here’s a snippet of information for you. I’ve only had three jobs in my career to include; 16 years with the Nazdar Company, 9+ years with TAS, and before that 10 years with Renold Australia (www.renold.com.au) one of the world’s leaders in industrial transmission products. So, your question about my experience in this area is a just a little off base. PW Response: I’ll concede the point that the RPM of the electric motors on the M&R and PrintEx could be similar at max speed, but that isn’t how screen-printers run their presses. The AC drives are operated at much lower speeds, especially when using heavy bodied plastisol inks such as whites, high density, and other specialty products. It’s in these applications where a worm gear reducer with the appropriate ratio for the application will significantly reduce the stress on the motor by allowing it to rotate faster at slower print stroke speeds. PW Response: You’re welcome to stand by your position, but you are still wrong. Do you honestly expect people to accept your position that M&R would produce their own pulley’s “In-House” versus sourcing them from a mass producing manufacturer on the open market? 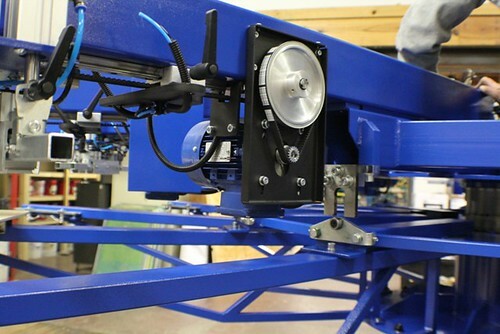 What other components and assembly would be involved that couldn’t be cost effectively produced at M&R? After all they previously used a direct drive belt and pulley system more than 10 years ago. If M&R ever decided to go back to the drive belt and pulley system that PrintEx is using, I have no doubt that they could do it at a lower cost than the worm gear reducer that they currently use. Robert: Please see above for qualifiied responses to your post, and that's what I have to say on this issue.